Members of the Somru team at work in one of its Charlottetown facilities. 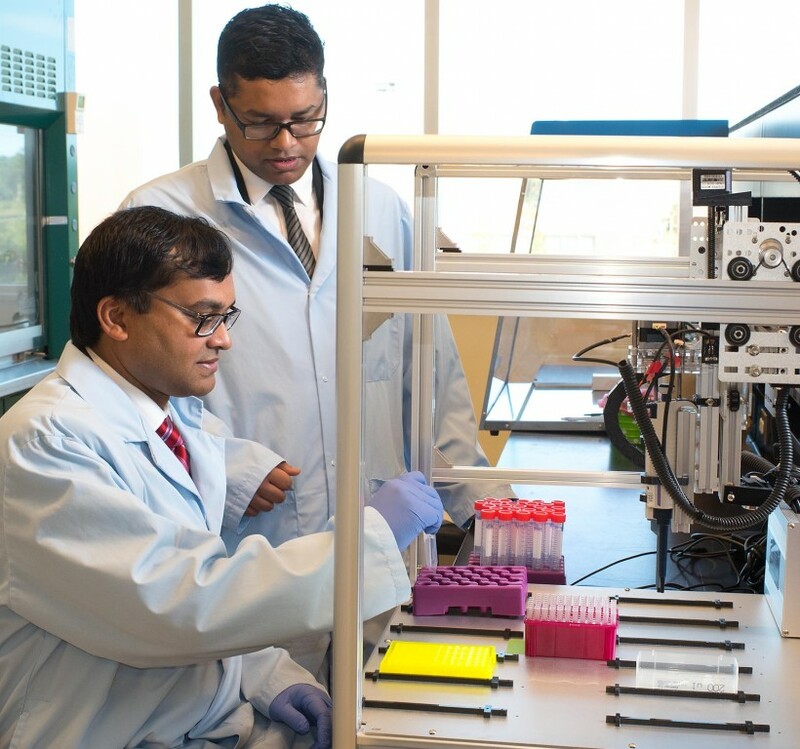 To help launch its new products, Somru BioScience of Charlottetown is raising a $7 million round of funding, and already has commitments for almost half this amount from government funders. During a presentation at the 2018 Atlantic Venture Forum on Thursday, Somru Vice-President Mohammed Moin said the company has secured commitments worth $3.3 million in loans and grants from such bodies as the Atlantic Canada Opportunities Agency, the National Research Council's IRAP program, Innovation P.E.I. and Skills P.E.I. Somru is developing a range of products centred around antibody technology for research, diagnostic and clinical applications. Its aim is to create technological solutions to accelerate drug development. Moin shared updates on the life-science company during the Growth-Stage Company presentations at the AVF in Halifax. The money will be used for research and development of some of Somru’s latest products. One development is IntelliB, a software solution that helps drug developers generate a fingerprint-like analysis of a novel drug to help copy it. The company is also developing a proprietary method for producing antibodies using chickens and their eggs rather than lab mice. Last September, Somru moved into a 5,000-square-foot office space in Charlottetown. Moin hopes to double his workforce by the end of the year, bringing the number of staff in its three Charlottetown facilities to around 40 people. The company serves more than 70 clients scattered across 23 countries and is projected to rake in $1.5 million in revenue for the next fiscal year. And, through a significant partnership that started in 2017 with Radiant Pharmaceuticals, a pharmaceutical company in Bangladesh, Somru predicts sales of $50 million over the next five years. The company's origins date back almost 15 years to when Moin moved to Canada from Bangladesh to study at the University of Prince Edward Island. His brother, Rafiq Islam, was attending university in Nebraska, where he was researching disease detection. In 2012, they started Somru. And, because of its network of support for biotech companies, Charlottetown became the company’s headquarters. Somru was one of six growth-stage companies to share their stories at the sixth annual AVF, along with Appili Therapeutics, BlueLight Analytics, Celtx, ProcedureFlow and VineView. The two-day forum will conclude Friday afternoon.